Last week I came back from a two week holiday. I was excited because weeks before I had ordered a new 3D printer. An innovative tool that is changing the way we produce our stuff. In my opinion it is one of the first steps back to localizing our manufacturing process. So as soon as I arrived back I decided to not only make an unboxing video but to also challenge myself to 3D print an really awesome object instead of printing something simple and boring. And so I did. In the many months prior to my purchase I had seen quite a few videos online on 3D printing. I had come to know that you could download 3d objects for free from a website called thingiverse.com. On the website I found what I was looking for…an awesome design! It was an lamp case which had a very organic cellular look to it. So I had decided on the object I was going to print. I had received my 3D printer. I was good to go start filming the video. Because of its build volume. It had a touch screen. Instead of hooking up a computer to the printer I was able to control the printer from its own touchscreen. And I was happy to find out that the menu was easy to understand and very responsive. According to reviews I had found online this printer had a high quality build. It had an all steel casing. The excellent touchscreen. And when I unboxed the printer it felt very reliable. There were no parts that looked fragile. It seems to be important that the material does not cool off to quickly and warp when the first layers are being laid on the surface. Which determines the succes of the final printed object. This printer had one so that was good. I paid 999 USD for this printer. Given that it had the above mentioned points it was very reasonably priced. I had read about other printers with similar specs that were much more expensive. I think this is made possible because the company just recently (summer 2014) launched their first Kickstarter project producing the previous model and could learn from the mistakes from other companies and incorporate all the best from all the previous printers on the market. Their 3D slicer software. I didn’t like their software for the Mac. It’s still in beta and you could notice that. It was very laggy and constantly crashed. For those newbies (like me) , a Slicer is a piece of software that imports a 3D model, which you have download or created, and translates it into code once you have entered all your preferred variables like precision, printspeed, layer height. The code, called Gcode, then can be saved on a USB memmory stick and can easily be plugged into the printer. 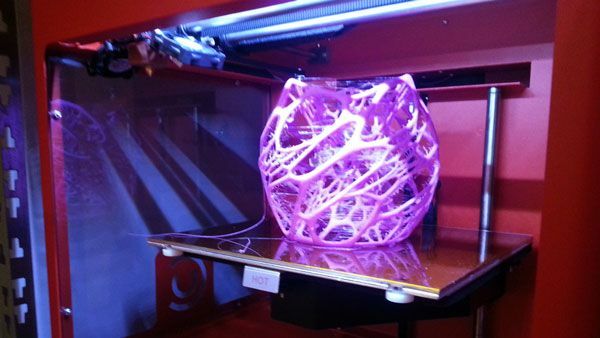 The printer will recognize and understand what and how it has to print the 3D object. Brim = 5mm This helps it stick to the bed, because the footprint is a quite thin which caused my print to go wrong the first two attempts.